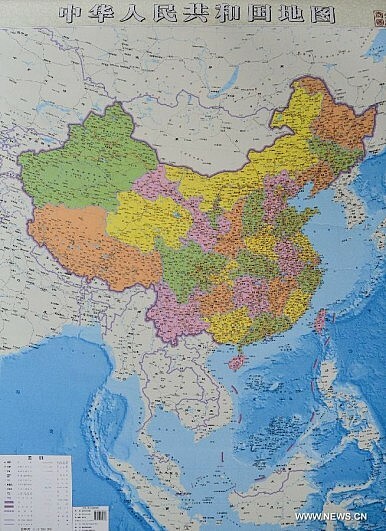 With the publication of its latest map, China has declared “mapware” in the Western Pacific. Last week, Beijing made another move to bolster its South China Sea claims that is sure to turn heads. And no, it was not the placement of another oil rig off of Vietnam’s coast. This one is much more slick and designed to slowly advance China’s real strategy to gain control of the area: to win the perception game at home and abroad. So what did China do this time? It published a new official map of its territory. So the first thing you are probably asking — and rightly so — is how could something so mundane actually be news? In this new map Beijing essentially claims as sovereign territory almost all the disputed area of the South China Sea (and parts of territory it has in dispute with India). China’s new strategy seems quite clear and mimics one of the classic scenes of that that quintessential American sales scam movie Boiler Room: act as if (warning, the language is of adult nature) you are the sovereign ruler of a territory — by patrolling it, by claiming and locating natural resources and issuing maps showing you control it — and you slowly over time beat down other claimants who can’t match your actions. Using such a strategy, or what I call “Mapfare,” is certainly not new for Beijing. Veteran Diplomat readers will recall the controversy in late 2012 when Beijing issued new passports with map photos that caused quite a stir in the region. This new challenge in the form of a map feels a little different. Look at the actual map. You will notice we are not dealing with the infamous nine-dash line anymore: we now have ten such lines. Considering Beijing’s increasingly aggressive moves in both the East and South China Seas in recent months, these expanded areas seem to constitute what areas China considers part of its “core interests.” From the waters off of Taiwan all the way down to Indonesia’s coast, to put it simply, anything in inside these red lines is a no-go zone for Beijing. China will fight with all means necessary to secure its claims — essentially declaring ten red lines in the South China Sea that are not to be crossed. It will use anything short of kinetic conflict to exercise dominance in this part of Asia. And if conflict did come, well Beijing has all sort of anti-access tools at its disposal to give any great power navy a hard time, knowing its growing military power is becoming harder to match. Over the past several years, China has made it clear it will continue pushing its claims until stated goals — while distant fantasies just a few years ago — slowly become reality. While the United States is clearly distracted by events in Iraq and Ukraine, Washington needs to worry about what is happening in Asia. With over $5 trillion dollars’ worth of sea-borne trade passing through what Robert D. Kaplan rightly named Asia’s Cauldron, the South China Sea is a test case for whether the idea of the maritime commons, open to any and all sea trading nations, will survive in its present form. If China is slowly allowed to alter the status quo and take control of the South China Sea as its sovereign territory, a dangerous precedent would be set. Who is to say Beijing would not export this example to the East China Sea or Russia would not follow by example in the Arctic. As sad as it is, maps are now weapons in a much larger struggle. Take notice Washington. Beijing has.